When added to Buzz’s current arsenal of “Comment” and “Like” (and Email), Reshare completes the social circle that most of its competitors have set up. It works exactly as you’d expect: if you see a Buzz post you like that you want to share with your followers, simply go to the bottom of the post and click the Reshare button. 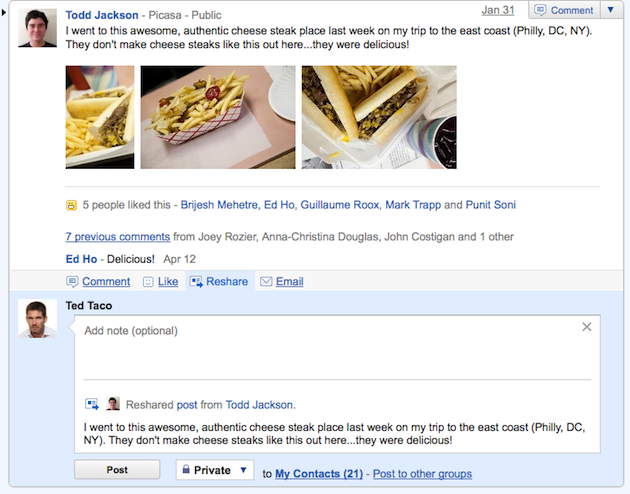 An input area will drop down and you’ll be able to add your own comment on top of whatever Buzz you’re resharing. This will then get injected back into your followers’ Buzz streams. The key to this may be the ability to leave your own comment on top of anything you reshare. This makes the functionality more like a Tumblr Reblog than a Twitter Retweet. The inability to leave your own comment with a Twitter Retweet has been the subject of much controversy amongst Twitter users. Previously, Retweets were an organic thing done by the community, in which you shared something simply by copying and pasting a previous tweet led by “RT @username.” Twitter, in the hope of making this process more streamlined, baked it into the service, but left out the ability to add your own commentary. As a result, some people still do it the old, manual way (or use clients that do it the old way). It’s a two-click process (“Reshare” then “Post). Google debated making it one-click, but decided having the option (in the drop-down) to reshare something with a limited group of people was important. Everyone who has reshared a post will show up (as a tiny icon) below your comment when you reshare something. The same content being reshared multiple times will be collapsed below the latest one in your feed. The reshare function forks the conversation to a new thread. Google thought a lot about this, but ultimately decided this was the best way for now. They’re thinking about a non-forking option too though. 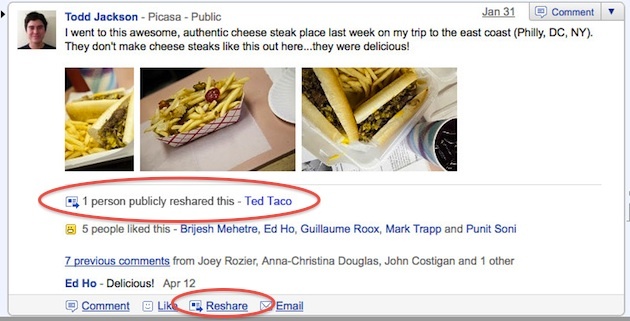 Liking a shared post only “likes” the reshared version, not the original share. So, about the name. 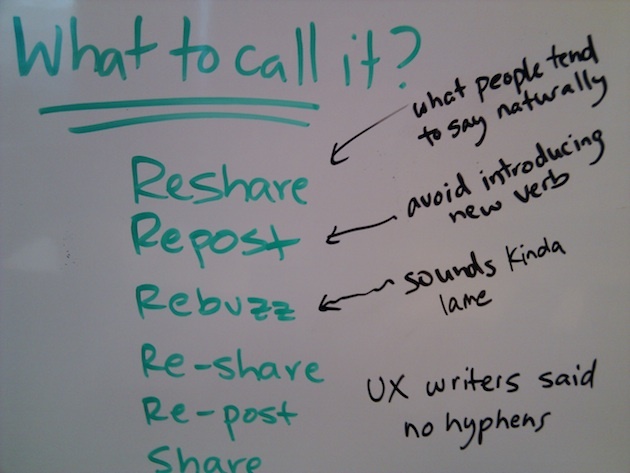 I asked Google why they chose to go with Reshare rather than the obvious “Rebuzz.” They pointed me to the picture below. Apparently, Rebuzz was being considering but was ultimately killed because it “sounds kinda lame.” That’s somewhat true, but for branding purposes, I think it may have been the right call. And I suspect people may call it this anyway. They also considered “Repost” but wanted to avoid introducing a new verb. So ultimately they went with the most literal choice. The ability to reshare was one of the most requested features, the Buzz team says. And it competes a strong run of 16 new features in 15 weeks (they had been shooting for one new feature a week) — of course, many of those were features that users demanded to make Buzz less annoying. It’s getting there. This Reshare feature will be rolling out to all Buzz users over the course of the day.